Enterprise desktop applications use the power of internet or network to share the information with different stakeholders of the business. The report will detail the industry of the hardware stores, organization and department for that enterprise system are required. The report will discuss the concept of the application in business by considering the requirements and scopes. Various business drivers will be discussed those are promoting the use of the application in business. The benefits and target audience of the application will be discussed along with their importance and usability in the workplace. Desktop application and its impact on the staff, process, and procedures will be discussed by putting the organization in the centre. The report will focus on prototype design and use of modules in business by demonstrating the functions and features in the form of screenshots. Hardware industry shares approximately 18% of the national growth because the industry is sustainable with other industries related to manufacturing and production. Hardware components are used in almost every business sector to support the continuous usage and improvement in the services. The industry is regulated on the support for raw material and skills to transform the material into hardware components. The organizations in hardware industry are related to manufacturing of products or promote the sales to end customers and trades in the form of pre-packed products. The organization is offering services in hardware industry with a diverse range of products related to ironmongery, fastenings, fixing, plumbing, gardening, electrical and other. Bulk Hardware has an own large office in London and serving since 1974. The continuous forty years of services have added the staff of 100 and more employees in the organization. High quality in products and eye-capturing packaging are some of renowned for the organization. The organization offers the purchasing and distribution but the users need to register and login to complete the orders through the dedicated secure gateway. Recently the organization started to introduce own branding and knitting products (About Bulk Hardware, 2017). Bulk Hardware has partnership and collaboration with top brands in hardware industry to trade the products. However, the organization has control on the large set of customers to overcome the prices and quality pitfalls. The organization has big warehouses across London. Bulk hardware needs to manage the inventory and support the activities of the accounting and finance along with the collaboration to employees in distribution and supply chain. Thus it is important for the organization to control inventory which also helps accounting and finance department to control the flow of products and manufacturing for stock (About Bulk Hardware, 2017). The concept behind the development of the desktop application is to improve the management of information in an accurate and effective manner and reduce the cost on manual processing in an organization. The enterprise application desktop application is required in business to simplify the communication, information processing, transaction processing and decision supporting in business. The issue of less productivity, degraded quality, and improper communication are some of the factors those promoted the need for the desktop application. The concept of the desktop application is to drive the business with simplicity. In inventory management of Bulk Hardware, it is required to record the name of the products and associated details for the amount and prices. The desktop application is conceptualized to enhance the accuracy and availability of the information as the organization can easily store and process the information to generate the reports for financial department and production department (He and Da Xu, 2014). The data of the inventory system needs accuracy to handle the effective number of user requests for the order of products. 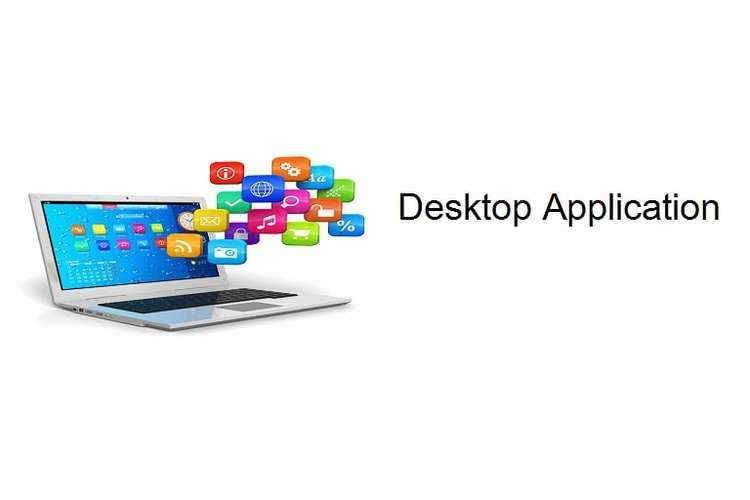 The desktop application helps to manage the information and resources effectively. The concept of the desktop application is to offer the services inside a connected network to enhance the usability of information. The productivity can be improved by using the desktop applications. Enterprise desktop application is conceptual to run on Windows operating systems with all the functions for inventory management. 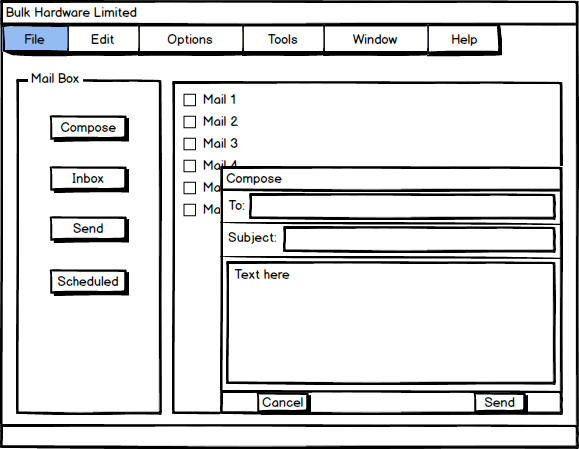 Graphical and simple user-interface with the centralization of information has demanded the enterprise desktop application (Sawicki et.al, 2016). The concept also has the root behind the online selling of products and employees need to collect and process the data along with the printing of orders and invoices. The concept of the enterprise desktop application has the influence of the business factors. Several conditions and requirements of the business have promoted the need for desktop application in business. Bulk Hardware Limited can face the motivation from the following drivers to attain the best outcome in practices and management so that customer support can be improved and brand values can be created. Competition and business process: the organization has less productivity in employees so that inventory department has to meet the competition with high accuracy in information. A business process is not so effective to compete in the market for effective customer order processing and distribution of products to trades (Weske, 2012). In order to attain the optimization in business operations to manage the workload of inventory within the cost, the organization has felt the need of the desktop application. Information sharing and quality: drivers of quality and performance have enforced the organization to implement the desktop application in inventory department. 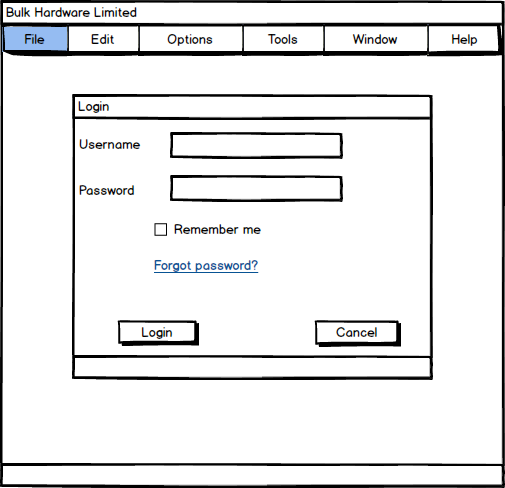 Bulk Hardware Limited needs a desktop application to use the information simultaneously to support the order processing of website and communication with other departments. The requirements of high quality and sharing of information have promoted the business towards the use of enterprise applications. Control on production management: the organization has started to manufacture hardware components for the plumbing and fixing so that stock management is a big issue. The proper control of inventory has promoted to use the power of enterprise application for the control on the cost of operations, investment, and productions for an effective outcome. The need of standardization: Bulk Hardware is expanding the business to cover more customers through the internet. Therefore, digitalization is a new requirement of the organization to attain the benefits (Bano and Zowghi, 2013). The standardization of business process to attain the performance and quality in work, the organization wants to implement the desktop application so that multiple stores and branches can be connected for real-time communication and statics for business. Besides all these drivers, customer satisfaction handling and promoting of business to end traders in the organization have promoted to use the desktop application. From the perspective of the computer application, the inventory system can get the benefits of automation in work, multiple format sharing and usability of information, centralized control, and availability of data and management of resources. Management of information: the organization can handle the information in a centralized database so that all the authorized users in the enterprise can access the information whenever required. Databases are useful to support the desktop applications for consistent and integrated information. The benefits of accurate information, real-time storage, and processing, high availability, and control of information are some of the advantages those are attained with a desktop application (Kirchmer, 2012). Also, the organization uses the desktop application to secure the data from the direct access as the application works as an interface to make the access constraint for security implementation. Productivity: the organization can process more control and operations on stock without the excess need of employees as the automation is supported in a desktop application for most of the routine works. In this manner, the overall productivity is improved within the optimal use of cost. Availability: desktop application helps the organization to retrieve the data from the computers without the use of internet connections. The dependency on the network connectivity can be reduced and product details and order processing can be isolated from other departments. 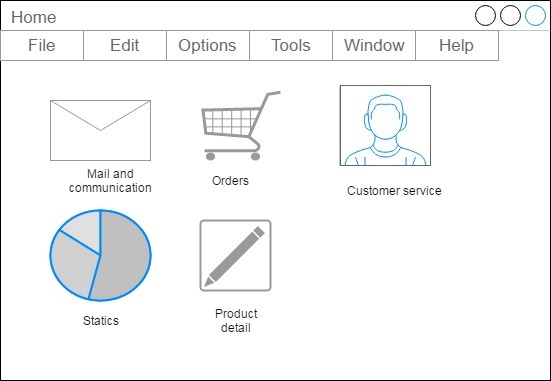 Standard and well-structured user interface: desktop application in business helps employees to accomplish the functions like accounting and product database update. The standard approach of product management and communication helps to reduce the false activities and operations (Chen, 2015). Effective user interface helps to attain the standardization in operations to attain quality and productivity. Human erroneous activities in stock control and management can be reduced with the use of enterprise application in the workplace. The use of enterprise desktop application enrolls various stakeholders as the target audience of application. The target audience is those stakeholders of the business those are receiving the direct as well as indirect benefits from the adoption of application in Bulk Hardware. Following are the stakeholders those are using the desktop application in the following manner. Manager: managing units of stock control or inventory are the first target audience of the desktop application implementation in business because they use the system to attain the efficiency in the data retrieval process to drive the decision accurately. The manager can use the application to monitor the products, processing, and orders through the use of the desktop application and control the stock by making use of strategies in consideration of other activities of departments (Wohlin et.al, 2012). The manager uses the application to control and review the operations of the employees as per the guidance for the objective accomplishment. End-users: the employee those are using the desktop application under the supervision and guidance of manager are the most important stakeholder in business. Employees of inventory control department fetch, store, process and distribute the information under the control of permission and responsibility assigned to them. End-users process the information and support the management towards the better scope identification and management. Suppliers: the organization serves the products as pre-packed products those are traded to suppliers and other organization. Suppliers associated with organization needs assistance and order processing through the secure application. Suppliers can be addressed and supported in transaction and order review through the desktop application. For communication also, the application is important so that older queries can be readdressed and information can be offered quickly to improve their experience with the organization. Customers: Customer satisfaction can be attained with the help of desktop application as the overall processing is under the strict management and processing so that high quality and performance is achieved towards the better customer satisfaction (Quintana et.al, 2013). Customer requirements and expectation regarding the product orders and payment processing preferences make the customers as the audience for a desktop application. The strategic objective of the organization is to simplify the business processes and increase the operational efficiency of the staff. Bulk Hardware has limited staff members to handle the warehouse in London and hence it is important to improve the efficiency of the staff and simplify the processes. Also, the staff members follow practices and process those are more aligned to traditional approaches to work management. Staff members have the influence of the desktop application in their role and responsibility as most of the employees those are working on a review of information are transformed into other roles because the application is effective to share and process the valid information. A staff member needs training and development program to understand the functions and features of a desktop application (Broy and Denert, 2012). The introduction of new software and hardware in business operations have put new requirements for staff members in the business. The process to manage the information of inventory is reshaped in business as the application is effective to automate the routine jobs with high accuracy and security. Time-consuming operations like the collection of data and orders from the customers and traders, processing of data for the delivery of orders on specific dates, management of payment collection, sorting of work for priority, optimization of resources and arrangements for dynamic operations are simplified. The process of order and payment handling is bringing on application to review within effective time and quality to attain customer satisfaction. Therefore, the process is shorter for optimal activities to improve the performance and quality. Bulk Hardware Limited has achieved the influence on the procedures for decision-making activities, real time support, data availability and sustainability (Kumar, 2013). The desktop application is effective to standardize the structure of reports and records to generate from the application. Enterprise desktop application has simplified the dynamic actions in the form of static optimal actions to attain the efficiency in operations. The organization has several functions and features in the prototype design as it represents the desktop application. The organization can use the communication tool, product management tool or other tools to accomplish the objectives. Product details can be easily updated in the database associated with the application. The organization uses the authentication system to prevent the unwanted access to data and application functions. Authentication is useful to record the user activities with the system and information. 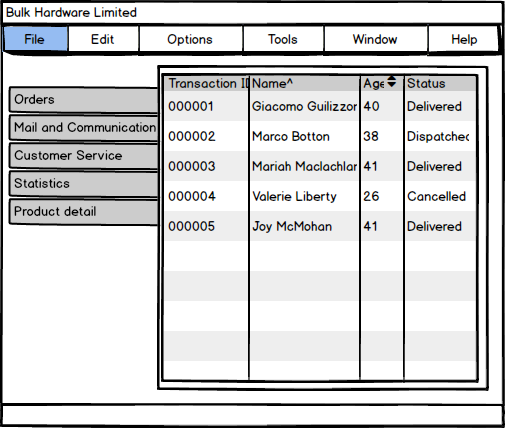 In order tab, the organization can view, process and modify the orders. This option is provided to control the inventory according to the orders. If the product is not available in inventory then production department can be consulted through mail tab (Sabale and Dani, 2012). Statics helps to know the availability of the specific products and services from the inventory. The statics also shows which product is shipped and which are under processing. Statics help the organization to understand the revenue and order with specific products. Order tab is effective to know the orders made for the specific products. It is required to generate the invoices and order reports. The desktop application also offers the services related to customer services. The application has an inbuilt function to offer the services related to the availability of products in the organization to place the orders. The filter is another function in application to sort and filter the information according to requirements. Several other features are also used in the application to support the user activities and preferences (Palma et.al, 2012). For example, printing is offered to get a hard copy of the information, customization through setting menu, dropdowns to select the date and products and list to constrain the inputs and selection. Such features and functions are useful to make use of the desktop application for various organizational functions for inventory control department. The application is designed especially for the Windows desktop so the .Net framework is used as the development platform for user interface and programming of internal logic. Windows server operating system is used to deploy the application and Oracle database system 11g is preferred for the data management. The application is programmed in Windows proprietary C sharp language due to high integration and native interface in windows along with the high availability of library functions. The Windows-powered visual studio is used to prepare the front end of the application including the user interface for main screen and dialogs. Desktop application of the organization can use the cloud services to manage the data sharing and communication among various departments in London. Legacy hardware like computer systems can be used in an organization to capture and process the data whereas cloud services are used to push data to the application so that load per hardware can be reduced (He and Da Xu, 2014). Cloud services are useful to achieve the centralized control and storage of data with high availability. The organization can use Scrum methodology for the development as it is effective to complete the application as the combination of modules. The iterative process is used to complete the module under the supervision of leader and manager and tested well for the desired outcomes. In this manner, changes in the functional and technical requirements are reviewed and identified at the completion of each module. Scrum methodology is used due to high integration of resources for the functions. Technical outcomes of application are based on the functional achievements in the development. Testing is required to ensure that all the functional and non-functional requirements with application developments are achieved. Following are some of the testing strategies those are used to complete the application development with the desired outcome. Unit testing: individual module of the application can be tested for the functions and features so that it can be visualized that every correct functioning module is useful to complete the application. 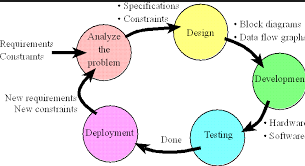 Integration Testing: all the modules of the application like transactional module, form, database connections and help content etc are integrated to make a collective application (Wohlin et al, 2012). Integrated testing of application is used to ensure that application is working properly with functions and features. User acceptance testing: the user has the responsibility to test the application program for acceptance. They have to test the application for functions and features as they are expecting into complete business operations. The organization has to address the internationalization of the software for the global market so that it is required to address the issue of language and sharing of content. The application can use the support for multiple inputs and language for content. There is a centralized database system used as the backend to support the application whereas end computers are using the application to fetch and store the data in the database. The organization is expecting the application to boost their business operations and objectives so there is a little scope to use social media. Therefore, a separate program or utility is developed to offer communication and data sharing with customers and employees in business. It is used to support the sociality in business for high-quality data collection on expectation regarding services. The major risk for the application development is to manage the code under the complex structure and backup the information from the large size database. Database backup: backup is required in the application to offer the data availability whenever the present database is corrupted or compromised. The organization can use hot backup in which all the recent data can be cloned to reduce the risk of data loss and theft. Code management: with increasing lines of codes in application development, it becomes complex to manage the code for changes. Version control system like git-hub can be used to manage the code to make changes. It is required to integrate the components of the application to attain the desired functions and features. The application is deployed on the test server which has configuration and services similar to the actual server so that it can be used to test the application. The server of the application is deployed with the database connection to integrate the application and database for synchronized operations. Once the outcomes of the test servers are satisfactory then application and database system can be migrated to the actual production server in the organization and it can be used in real business routines. The target audience of the application is identified and promoted to use the application so that their expectations and feedbacks can be collected to make changes accordingly. The organization can offer the per-use demo of application to develop the understanding of usages and functions then the user can use the application to offer changes. Once the requirements and changes are determined even after the training, then the can be documented and introduced in the application (Chen, 2015). Change management in the application is considered for functional and technical requirements those are required to increase user acceptance level. The organization can use the legacy systems to avoid cost and time investments whereas it is also useful to reduce the dependency on the cloud services for data exchange. Legacy systems are used to fetch the data and support the user activities so that cloud services are only used to retrieve or store the updated information only. Legacy computer systems are used to host the application and database for correct functioning and services. In order to maintain the network, the server is configured to record user activities so that data access and modifications can be used to roll back the changes in case of failures. Log files from the server are useful to record the activities. Besides it, the application is tested and maintained to reduce the bottleneck performance (Kumar, 2013). Possible changes and up gradation are considered to keep application performance and quality high. Server maintenance is required on regular basis to ensure the performance. The application has the opportunity to address the more employees and customers through the mobile application so that most of the operations in business can use the real-time data. Present structure and data can be accessible on the mobile devices so that employees can report from any location and customers can be engaged in business. The present system can be improved in term of secure transactions and high customization for functions. The report has been provided the detailed information about the industry, organization, and department in which the enterprise desktop application is required. The report has been discussed the concept of the application by considering the needs, scopes, and challenges for the organization those can be resolved with the help of desktop application in inventory control department. The report has been discussed the various business drivers those are influencing the adoption of application in business in a positive manner. Benefits and target audience of the application have been discussed in the report. The impact of the desktop application on business staff and process has been discussed in depth. Also, the prototype has been prepared to assist the organization in functions and features those are required to complete the application with high adaptability in the workplace. It is recommended to customize the application high user acceptance and consideration of cost and time so that desired functions can be achieved effectively. Bano, M. and Zowghi, D., 2013, April. User involvement in software development and system success: a systematic literature review. In Proceedings of the 17th International Conference on Evaluation and Assessment in Software Engineering (pp. 125-130). ACM. Broy, M. and Denert, E. eds., 2012. Software pioneers: contributions to software engineering. Springer Science & Business Media. Chen, L., 2015. Continuous delivery: Huge benefits, but challenges too. IEEE Software, 32(2), pp.50-54. He, W. and Da Xu, L., 2014. Integration of distributed enterprise applications: A survey. IEEE Transactions on Industrial Informatics, 10(1), pp.35-42. Kirchmer, M., 2012. Business process oriented implementation of standard software: how to achieve competitive advantage efficiently and effectively. Springer Science & Business Media. Kumar, J., 2013, July. Gamification at work: Designing engaging business software. In International Conference of Design, User Experience, and Usability (pp. 528-537). Springer Berlin Heidelberg. Palma, F., Farzin, H., Guéhéneuc, Y.G., and Moha, N., 2012, June. Recommendation system for design patterns in software development: An dpr overview. In Proceedings of the Third International Workshop on Recommendation Systems for Software Engineering (pp. 1-5). IEEE Press. Quintana, C., Krajcik, J., Soloway, E., Fishman, L.C.D.I.B. and O'Connor-Divelbiss, S., 2013, April. Exploring a structured definition for learner-centered design. In Fourth international conference of the learning sciences (pp. 256-263). Sabale, R.G. and Dani, A.R., 2012. Comparative study of the prototype model for software engineering with system development life cycle. IOSR Journal of Engineering, 2(7), pp.21-24. Sawicki, S., Frantz, R.Z., Fernandes, V.M.B., Roos-Frantz, F., Yevseyeva, I. and Corchuelo, R., 2016. Characterizing enterprise application integration solutions as discrete-event systems. In Handbook of Research on Computational Simulation and Modeling in Engineering (pp. 261-288). IGI Global. Wohlin, C., Runeson, P., Höst, M., Ohlsson, M.C., Regnell, B. and Wesslén, A., 2012. Experimentation in software engineering. Springer Science & Business Media.